It was another solid outing last night for the Portland Winterhawks as the Sven Bartschi/Marcel Noebels/Ty Rattie line exploded for 11 points in the 6-3 win in Game 3 against the Kelowna Rockets. The Hawks now have a commanding 3-0 series lead with a chance to wrap up the series tomorrow night in Game 4 at Prospera Place in Kelowna. From watching the game over the web, it was evident that the Rockets had no answer for the Hawks top line in Game 3 as they scored some very pretty goals and had numerous chances that they didn’t quite convert. In the series, the line has combined for 8 goals, 17 assists and 25 points. The Rockets have six goals as a team in the three games. But it wasn’t just the top line going, all of the Hawks lines had chances and the Hawks continue to roll line after line to create pressure on the Rockets defense. It was nice to have Brendan Leipsic back in uniform after missing the last four games. The word from the Kelowna side is that is what their best effort in the series so far and I would tend to agree. It may be a bit of a concern that all three Kelowna goals came from the defense as the forwards were held quiet for the second consecutive game. Both teams were missing key players due to suspension as Oliver Gabriel and Brett Bulmer sat this one out. 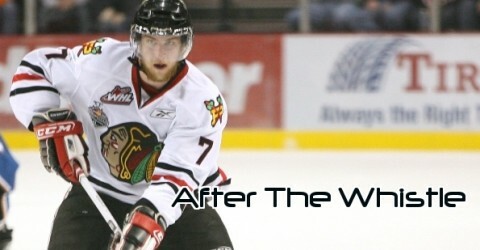 Both will be back for Game 4 as the “TBD” on Bulmer’s suspension was filled with “One Game” this afternoon by the WHL. I’m sure that most Portland fans will feel that the suspension wasn’t long enough based on the nature of the penalty. I’ve said it before on this blog, it is what it is. The Hawks won Games 1 & 2 with Bulmer in the line-up, and they have all the momentum heading into Game 4 with Bulmer in the line-up. From being around the Hawks Coaching Staff the last few years, I can tell you that their focus will be on their players and their game. If the Hawks play their game like we have seen in the first three games, there is a very real possibility this series ends on Thursday. If they start to get distracted by off-ice happenings (or on-ice happenings) that possibility lessens. It was helpful that Reagan Bartel posted some thoughts from VP of Hockey Richard Doerksen on his blog (Regan’s Rant, link on the left) and it was I expected to read. Having Bulmer back should help the Rockets, but adding Gabriel back for Portland should counter that. With Gabriel returning, it will be the first time the Hawks have had a full roster since before Bartschi left for his NHL stint. The fourth victory is the hardest in any series, and tomorrow I’m sure that will hold true. If there was any doubt, the photo is pretty conclusive that Sven Bartschi may actually be Superman. While Super Sven didn’t score on this play, he has been a huge reason while the Portland Winterhawks have gone 2-0 in their opening round playoff series against the Kelowna Rockets picking up five assists (he will have one added on the Hawks first goal from Saturday night later today) on the 10 goals the Hawks have scored in the series. For those fans that watched games 1 & 2 at the Veterans Memorial Coliseum, they saw a Hawks team that not only has some incredible skill, but they have a fair share of grit as well. The Rockets are a bigger team on paper, but the Hawks showed that they will not back down when pushed and they will not fall into the after the whistle silliness that has plagued this team in years past. The Rockets, meanwhile, have tried to get into the Hawks heads with Adam Brown’s puck stealing after the Game 1 loss and the antics of Brett Bulmer in game 2 (more on that in a second). In the end, the Hawks have been the more composed team and that has helped propel them to the two victories. One of the things that Todd Vrooman and I have talked about all year is the Hawks depth and that has shown in the series so far. There is no change to the Hawks game plan from line to line and everyone that has stepped on the ice has played with intensity and drive. We have talked a lot on the broadcasts about the play of the line of Joey Baker, Taylor Peters and Taylor Leier, and they have effectively shut down the Rockets biggest offensive threats. And that leads us to Bulmer, who should be the Rockets biggest offensive threat. Last night it was evident from his opening shift that his focus was not necessarily on hockey when he got nailed for unsportsmanlike conduct for showering Mac Carruth with snow as Carruth covered the puck. It only went downhill from there for Bulmer who finished the night with two unsportsmanlike minors, two kneeing minors, a kneeing major and a game misconduct. I’m not sure if any player has received three kneeing penalties in one contest and each one got progressively more dangerous. For me, you could see the circuits blowing for Bulmer after he was taken out on a tremendous hit from Tyler Wotherspoon in the second period and Bulmer went back to his bench and proceeded to slam his stick on the glass and slam the door once he got into the bench. From that point on, he was gone mentally, in my opinion. After the final straw for the hit on William Wrenn, it was important for Baker to step in and knock Bulmer on his can. What I liked most about it is that Baker did not drop the gloves and start throwing punches, he just ran him over. Now we wait to find out what additional sanctions, if any, are levied against Bulmer by the WHL. Not to be lost in the shuffle of what happened in game 2 is the 20 save shutout performance of Mac Carruth. Mac didn’t have to face a ton of shots as the Hawks did a nice job of limiting the Rockets opportunities (including only allowing four shots on five power play chances), but Mac was positionally solid and gave the Rockets nothing. Maybe it was fitting that Carruth made 20 saves to pick up his 20th career playoff victory on the day before his 20th birthday. The Rockets spent a lot of time trying to get into Carruth’s kitchen in games 1 and 2 and it had virtually no affect. That will need to continue in the next two games in Kelowna. I won’t be able to make the trip to Kelowna, but Todd Vrooman will bring you all the action on http://www.winterhawks.com. 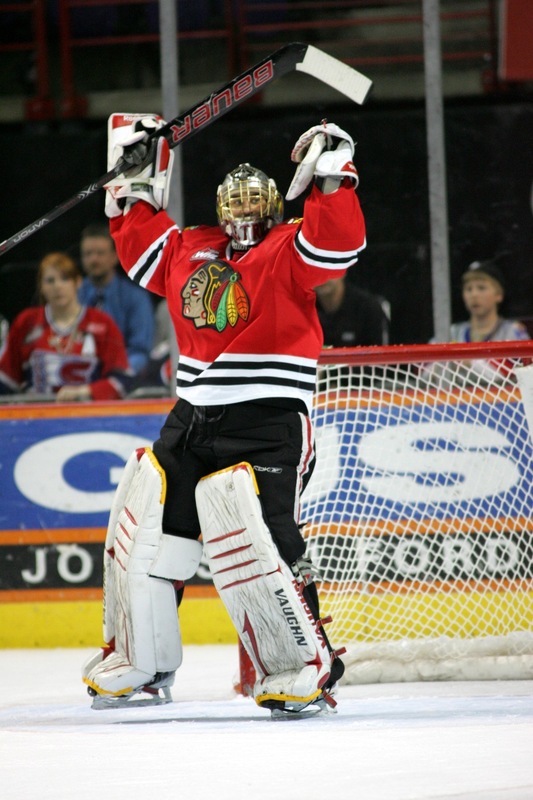 12/2/11 – Portland 5 – Everett 1 – Rose Garden: The Portland Winterhawks extended their home winning streak to eight games with a 5-1 win over the Everett Silvertips . The Hawks carried play for much of the first period, outshooting Everett 17-5, and scored the lone goal of the first at the 14:00 mark on a power play goal by Oliver Gabriel, who was playing his first game back with the Hawks. Portland extended the lead at the 3:10 mark of the second when Brendan Leipsic slid a backhand past Silvertips netminder Kent Simpson to make it 2-0, with Gabriel registering an assist for his second point of the night. Everett got on the board with just under three minutes remaining in the second when Josh Birkholz scored to cut Portland’s lead to 2-1 heading into the third period. The Hawks regained the two-goal lead early in the third when Taylor Leier came out from behind the Everett net and put it past Simpson to make it 3-1 at the 2:39 mark. Portland then made it 4-1 at the 12:24 mark when Sven Bartschi scored on a power play, his 12th of the season, and wrapped up the 5-1 victory on a goal by Chase De Leo with 46.7 seconds remaining. 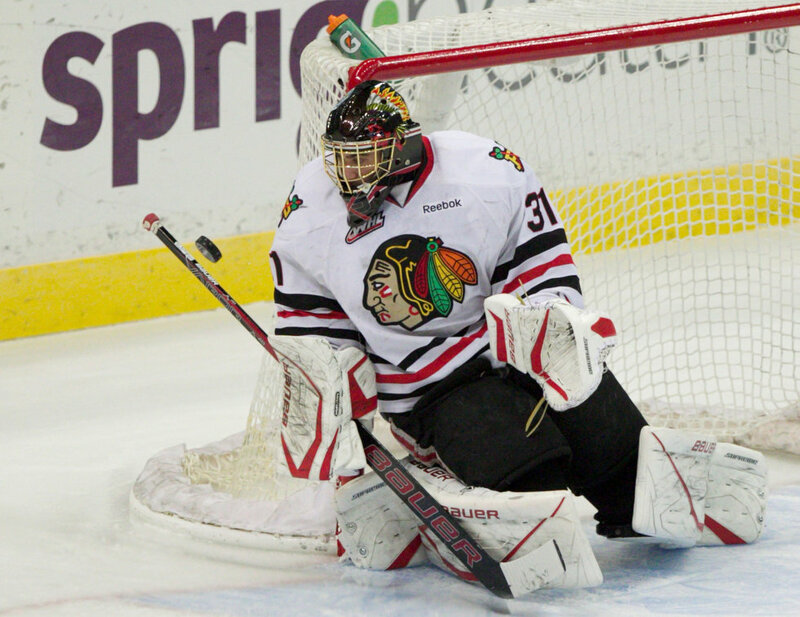 The Winterhawks held a significant edge in shots on goal throughout the game, finishing with a 43-23 advantage. Mac Carruth stopped 22 of the Everett shots he faced, while his counterpart Simpson made 38 saves for the Silvertips. 12/3/11 – Portland 7 – Seattle 1 – Rose Garden: The Portland Winterhawks hosted the annual Teddy Bear Toss Saturday, and for the second straight year it was Ty Rattie bringing out the bears, as he scored 2:52 into the game en route to a 7-1 win over the Seattle Thunderbirds. Rattie’s goal brought 10,249 stuffed animals cascading onto the ice. It was just the beginning for Rattie, who also had three assists to finish with four points. It was Portland’s ninth straight home win, and fourth straight overall. They tied a season-high with seven goals, and set a new season-high with 60 shots on goal, including 29 in the first period alone when they scored four times to jump out to an early lead. Once play resumed after Rattie’s goal, Winterhawks defenseman Tyler Wotherspoon put the Hawks up 2-0 at the 4:42 mark on a shot from the right faceoff circle, his fourth goal of the season. The Hawks then got two goals from Taylor Leier before the end of the period as they took a commanding 4-0 lead into the intermission. Midway through the second with the Hawks on a 5-on-3 power play, defenseman Joe Morrow fired a slapshot off a one-timer past Seattle netminder Calvin Pickard to make it 5-0. Portland then extended the lead to 6-0 with another power play goal at the 16:43 mark when Brad Ross put it past Pickard. Along with the six-goal lead, Portland took a 45-17 advantage in shots on goal into the second intermission. Seattle made a goaltending change to open the third period, replacing Pickard with Daniel Cotton, then got on the board with a goal from Burke Gallimore at the 4:31 mark to make it 6-1. But that would be as close as they would get. Portland forward Joey Baker scored his first career WHL goal on a power play at the 18:09 mark to round out the scoring and give the Hawks the 7-1 win. Mac Carruth was solid in net for Portland, picking up the win with 26 saves on 27 shots. Pickard allowed six goals on 45 shots through two periods. Cotton made 14 saves in relief in the third. 1. 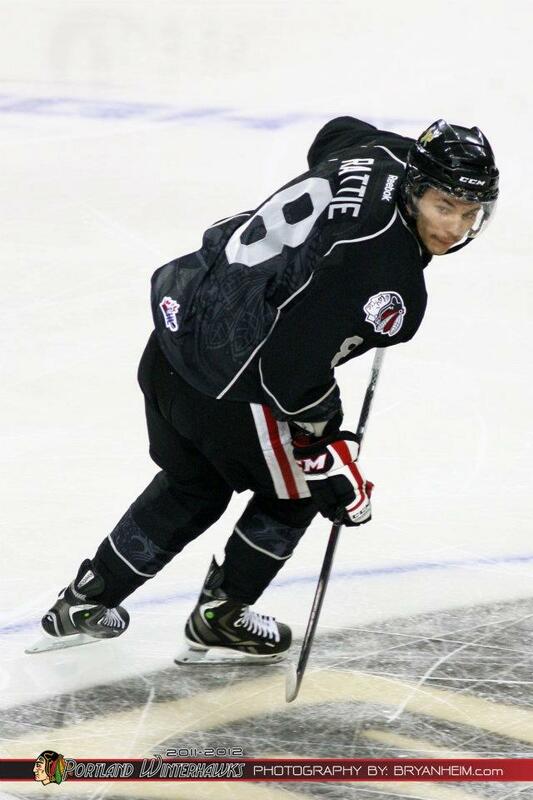 Ty Rattie: Ho hum…1-4-5 in 2 games…getting to be old hat for the Rat. 2. Sven Bartschi: See above…1-3-4 in 2 games. 3. Mac Carruth: Quietly, a 2-0-0-0 record with a 1.00 GAA, .960 save %. Oliver Gabriel added to roster from Springfield Falcons of the AHL. Zach Paterson and Tyler Sandhu signed to WHL Education Contracts. Back to back games in Prince George followed by a game in Vancouver on Friday and then the Tri-City Americans on Sunday. No time for me to do much detail, but another busy week for your Winterhawks. 1. Ty Rattie: Fairly easy call here…7-5-12 in four games. 2. Sven Bartschi: Another fairly easy call…4-8-12 in four games. 3. Joe Morrow: His number’s would make him #1 most weeks…4-4-8 in four games. The Team Canada World Junior Selection Camp roster will be announced on Monday morning from Edmonton. Ty Rattie, Joe Morrow and Brad Ross are candidates to be selected to attend the camp later in December. For games, the Hawks finish out their pre-Christmas home schedule with games on Friday night versus Everett and Saturday night against Seattle with both games coming in the Rose Garden. The Silvertips have been struggling, going just 5-17-0-4 on the season and they are current last in the Western Conference. They have only one win in their last 10 games, going 1-7-0-2 during that stretch. With Tyler Maxwell now gone to the Edmonton Oil Kings, a team that lacks scoring depth is now even more pressured to keep the games low scoring. Josh Birkholz leads the team with 10-14-24 in 24 games, but no one else on the current roster is close to a point per game. The ‘Tips may get d-man Ryan Murray back on Friday night after missing 14 games with a high ankle sprain. He had 3-3-6 in 10 games before the injury. Kent Simpson is the number one goaltender with 3.70 and .903 in 21 appearances. Their power play is middle of the pack at #10 (21.7%) while their penalty kill is 17th (75.2%). The Thunderbirds have played pretty well as of late and have a record of 10-12-0-1 and are fourth in the U.S. Division. They have gone 5-4-0-1 in their last 10 and had won three straight prior to losing to Kamloops on Saturday night. Veterans Burke Gallimore (12-7-19 in 23 games) and Marcel Noebels (9-9-18 in 22 games) lead the offense while they have been getting fairly balanced scoring with 10 players having at least 10 points. Branden Troock was injured again on Saturday vs. Kamloops and may be doubtful on Saturday after putting 5-4-9 in 21 games. Calvin Pickard’s numbers are improving and are now at 3.52 and .907 and a 10-9-0-1 record in 20 games. Their power play is 17th (19.1%) while their penalty kill sits at 16th (76.2%). Don’t forget Saturday is the Teddy Bear Toss night…so bring your bears!